I was so looking forward to reading this book, and I know that I'm probably the one-billionth person talking about this book, but I just have to say how much I loved it! In other reviews I've read, I've heard people wonder why Lena would be the main character, because she seemed not-so-exciting at first. Let me say I did not have this problem. I thought it was SOO interesting to learn about this society through the eyes of a person that agrees with how things are done! With books like this one I always wonder why people accept the rulings of the goverment and seeing it through Lena's eyes is pretty enlightening. Lena has a personal reason for wanting the treatment: her mother commited suicide because of this disease and Lena is afraid something like this will happen to her as well. She's horrified by the comments her best friend Hana makes, they seem rebellious and Lena fears for her well-being (and sanity). Even so, Hana manages to convince her to do some things that are not strictly considered legal. Then she meets Alex, a boy who is somewhat older than they are and therefore has already had the treatment. So it's considered safe for Lena to hang out with him. But is it really or is Lena in danger of catching the disease? The transition in Lena's thoughts about the cure and the goverment in general is slow and because of that very believable. If you've been told one thing all your life, you wouldn't change your mind about it in a heartbeat either. But she does, for Alex. Alex.. He sounds like a boy I'd fall in love with as well. He's sweet and patient and generally a good guy with strong opinions. He seems to be the right guy for Lena. I really should know better than finish books like this right before going to sleep! It was so exciting and sad and I needed hugs after because I cried like a baby. And OMG, what a cliffhanger! 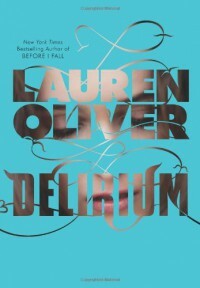 I can't believe Pandemonium (the sequel) won't be out until 2012! This one has a bit of Hunger Games anticipation going on.. Anyway, as you can tell, I thought this book was amazing, so if you haven't already: add it to your to-read list or just go out and get it and READ.